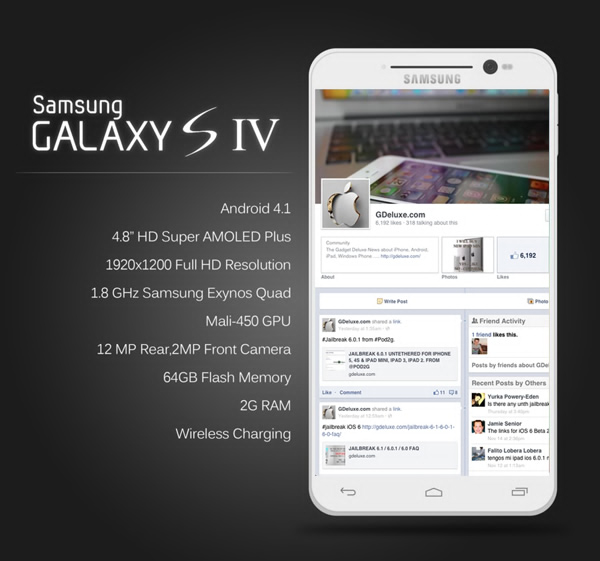 Evo & Grace: The WanderLusts: Samsung Galaxy S4 is Here! Samsung has launched a smartphone which allows users to control its 5in (12.5cm) screen using only their eyes. The Galaxy S4 follows on from last year's S3, a product that sold over 40 million units worldwide. At a lavish, Broadway-themed event in New York, the company also demoed the phone's ability to take two different pictures at once. Analysts widely regard Samsung to be the biggest challenger to Apple's dominance of mobile products. The Galaxy S4 will be rolled out globally at the end of April. An Android Phone You Can Control with a Wave or Tilt. The software and gestures you use to control the phone may be the biggest story about the Galaxy S4, but Samsung has also freshened up the hardware. The 7.9mm Galaxy S 4 looks a lot like the Galaxy S 3, albeit with a slightly thinner body and a larger 5-inch screen. The screen is also much crisper, with a 1080p, Super AMOLED panel. Internally, the phone has a quad-core processor and 2GB of RAM. It has built-in temperature and humidity sensors, and a removable battery. Unlike the aluminum iPhone 5 and the HTC One, the entire phone is still made of tough polycarbonate, even though the edges look metallic. The phone will come in two colors: white frost and a black mist. The standout hardware feature is the 13-megapixel camera (the S 3 had an 8-megapixel camera). The camera will take crisper and better low-light shots, Samsung says. "We have brought the interface from the Galaxy Camera to the phone," Drew Blackard, director of product planning. "We have wanted to make it easier for people to know how the modes work with images." In addition to the new interface, there are new features like dual shot and recording mode, which lets you combine photos and video from both the front-facing 2-megapixel camera and the rear camera into one shot or video.